We started the second term ..... so we must organize: here you have a planning proposal, and for each day you have the duties that you have to bring done (Sorry !! you must work !!). You know that the numbers refer to the pages of the textbook on which we must work, that is, make a scheme (not a summary !!) so that when we treat this topic in class, you already know something, so that we take the time to fix concepts and clarify doubts. Also, you have to remember to deliver the projects corresponding to this trimester within the deadline. From time to time, I'll inform you, there will be "weekly deals" with some extra activity, complementary of your training as future scientists. And, of course, we will try to make the laboratory practices as we go on with the syllabus. And remember that it is compulsory to present a project at the end of the term ... !!! 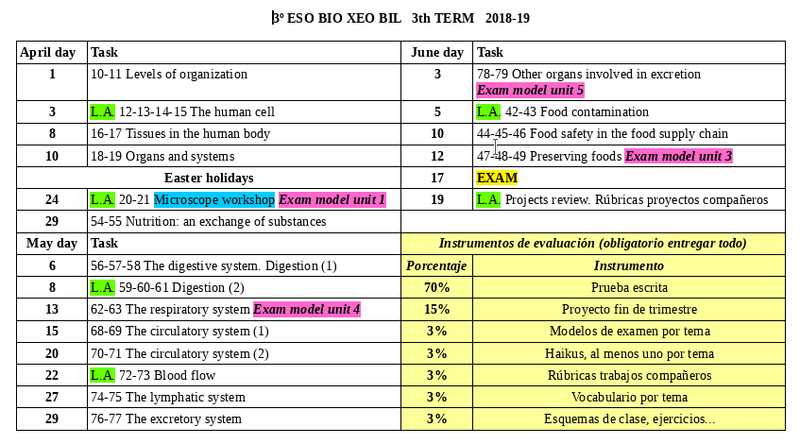 Welcome to the new academic year 2018-19; here you have a planning proposal for the first assessment, which lasts 14 weeks, and for each day there are the homework that you have to bring (Sorry, we have to work !!). You know that the numbers in parentheses refer to the pages of the textbook on which we must work, that is, make a scheme (not a summary !!) so that when we study this topic in class, you already know something and so we take the time to fix concepts and clarify doubts. Also you have to try to solve the exercises that you find, assuring you have understood the issue and you remember to deliver the works corresponding to this evaluation within the deadline. From time to time, I'll inform you, there will be "weekly deals" with some extra activity, complementary of your training as future scientists. And, of course, we will try to make the laboratory practices as we go on with the syllabus.